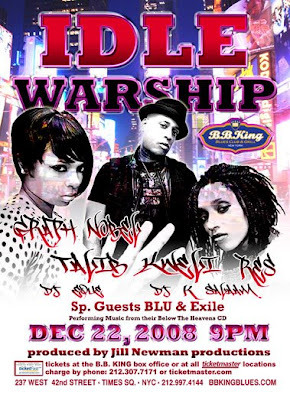 BlackRadioIsBack.com Music: Idle Warship | BlackRadioIsBack.com - Official Blog of the Syndicated FuseBox Radio Broadcast! Wanted to share this new music from what's looking to be the new Black Music Supergroup consisting of Hip-Hop MC Talib Kweli, Black Rocker/Singer Res and MC/Singer Graph Nobel called Idle Warship. The track we have available for download below, "Steady", is a pretty fly indication of the potential these folks have to give the music landscape a nice kick in the pants to get a bit more creative with the grooves and such. Going on the official website, there definitely seems to be a wilin' out soul/dance/rock music vibe going on with the crew. They're supposed to be doing a lot of touring and dropping music in '09, so I'm defniitely hoping for the best. Check out the video below and the music - what do y'all think of the Idle Warship movement? Shout out to my peoples Tunji Balogun for the heads up about this project! Music Video #2: Idle Warship Takes Over Your Party!